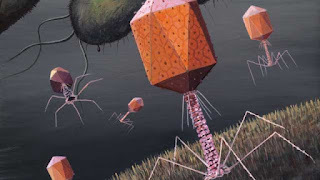 Coughing for Cystic Fibrosis: Phage Club! Yes, you should join the Phage Club! How? Why? Where? What? If you have used antibiotics in the past and felt they did not work so well you are right! Antibiotics are slowly becoming more ineffective. We need an alternative! If you have a chronic condition such as Diabetes or Cystic Fibrosis or have an immune problem, you WILL one-day catch superbugs and will need Phage Therapy because antibiotics are just not working for superbugs commonly found in hospitals worldwide. By donating $5 to the Gofundme crowdfunder you will be helping promote the knowledge and effectiveness of Phage Therapy and you will be on the Phage Club list! I have a Pseudomonas aeruginosa infection resistant to antibiotics. It is just one of many bacteria that people with Cystic Fibrosis get and have trouble controlling. I am going to show the world how Phage Therapy works and am going to visit Yale University where Dr Benjamin Chan there, an Associate Research Scientist of Ecology and Evolutionary Biology, will try to kill this infection in my lungs using Phage Therapy. The money I collect using the Phage or Fail crowdfunder will go towards making a documentary, getting publicity, press coverage, and help my travelling costs from Australia to the USA (people with Cystic Fibrosis are not rich :( ). www.the-scientist.com/cover-story/viral-soldiers-34289 from where I got the image above..